The first time I went to the Billy Goat Trail (Potomac, Maryland) with geology as the goal (as opposed to mere recreation), it was 2002. The trip was led by a professor at the University of Maryland. I was a graduate T.A. then, and didn’t know anything about the local geology. I remember at the end of the trip, the professor sent us out to search for “kyanite ghosts” (pseudomorphs of sericite after kyanite, produced during retrograde metamorphism). We didn’t find them on that trip, but the evocative phrase “kyanite ghost” stuck in my head. That’s pretty uncanny, eh? 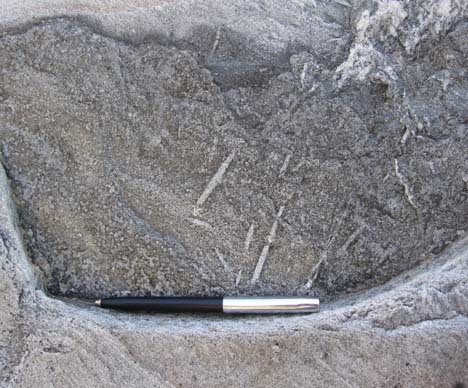 Two photos taken just over half a century apart, of the exact same square foot of clue-bearing rock. 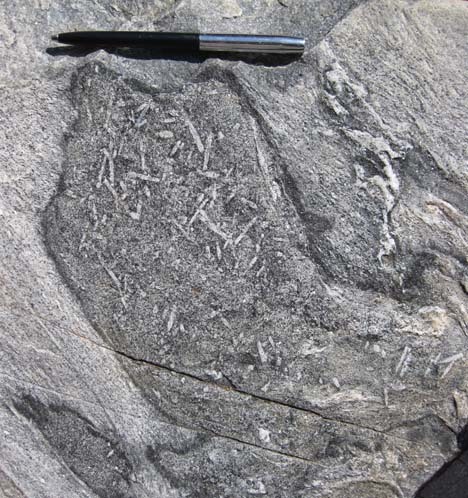 So, we have here large, bladed crystals that formed as porphyroblasts of metamorphic minerals during prograde (↑P,↑T) metamorphism, then those same porphyroblasts found themselves unstable as temperatures and pressures dropped (retrograde metamorphism; ↓P,↓T). Their elemental constituents found themselves in disequilibrium, re-reacted, and formed new minerals which occupied the same space and shape as the large, bladed porphyroblasts. 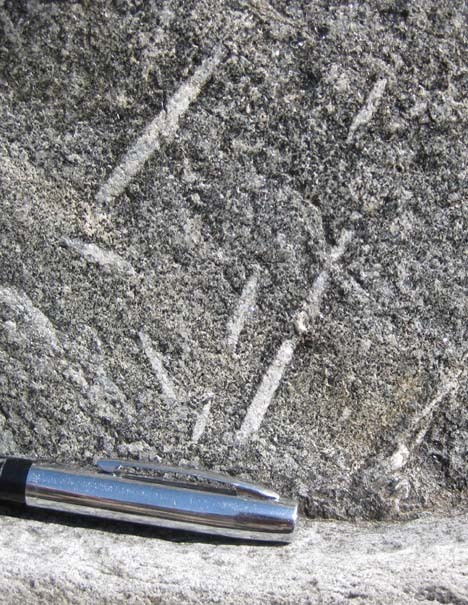 Today, you’ll finded that these “large, bladed crystals” are really aggregates of sericite (super-fine-grained muscovite). 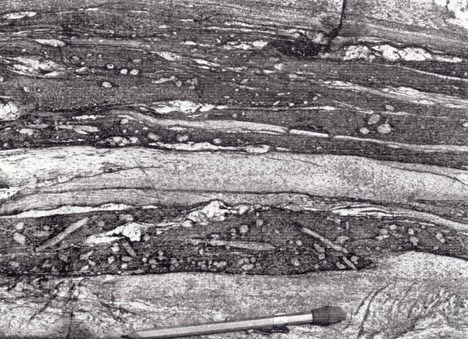 I assume he’s basing those statements on detailed petrologic evidence, but I haven’t seen his thin sections myself. 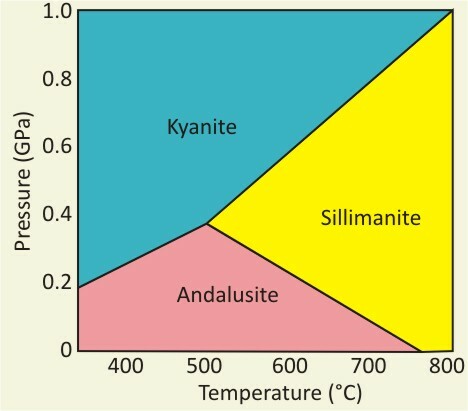 Tangentially, we’ve only been discussing the metasedimentary rocks so far, but E-an Zen and Phillip Candela point out in a 1998 guide to the area (for the University of Maryland geology department’s 25th anniversary hike) that the amphibolite units (meta-igneous, presumably) also contain kyanite or sillimanite but have not melted, which suggests temperatures in the range of 540° to 680° C, and pressures between 4.2 and 7 kbar (0.7 GPa). So which is it? Kyanite or sillimanite? I can’t claim to know the answer: perhaps someone with more metamorphic petrology experience than me can shed some light on which mineral they they think they see in these ghostly pseudomorphs. 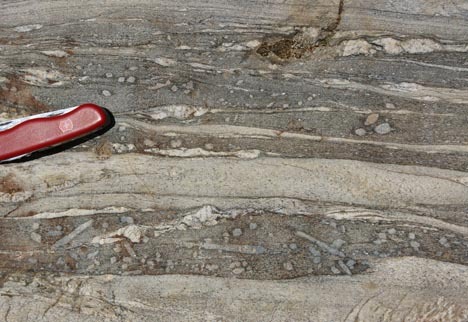 I have two questions for you: (1) What’s your favorite example of retrograde metamorphism? and (2) Have you had a similar photographing-the-same-spot-someone-else-did-many-years-before-you experience? Bierman, Paul, Zen, E-an, Pavich, Milan, and Reusser, Luke (2004). The Incision History of a Passive Margin River, the Potomac Near Great Falls, in USGS Circular 1264: Geology of the National Capital Region. Field trip guidebook. Fisher, George W. (1971). The Piedmont crystalline rocks at Bear Island, Potomac River, Maryland. Maryland Geological Survey Guidebook No. 4, prepared for the 1971 annual meeting of the Geological Society of America, Field Trip No. 4. Hopson, Clifford A. (1964). The Crystalline Rocks of Howard and Montgomery Counties. Maryland Geological Survey, Baltimore. Zen, E-an, and Candela, Philip (1998). Department of Geology, University of Maryland: 25th anniversary geology hike to Great Falls, and the Chesapeake and Ohio Canal National Historical Park. Field trip guidebook: September 19, 1998. * The “island” in question is Bear Island, which is not really an island (except during times of highest flooding). It’s just the land between the C&O Canal and the Potomac River in the vicinity of the Billy Goat Trail.